The other day, I was in a Bible study group of 14 ladies and one of them asked: Where Did Cain get his wife? When I posted about it on Facebook, two FB friends of mine asked how did I answer the question. Since it was too long to put my answer on Facebook, I decided to put on my blog. The following was how I answered the question, Where did Cain get his Wife? When God created Adam and Eve, they were already adults and were capable of having a child from day one. Let us remember also that the first commandment given by God to them was to be fruitful and multiply and replenish the earth. Following the death of Abel, Adam was 130 years old when he fathered his 3rd known son, Seth. Few questions we need to ask: How long were Adam and Eve been living together before they had a child? How many children were born to Adam and Eve in the span of 130 years? Although the Bible didn't say, at a birth rate of 1 child every 5 years, the first couple would have about 26 children in the first 130 years; and if 1 child was born in every 10 years, they would have at least 13. Now, another question we need to ask is how many of their children married each other and have children of their own in the span of those years? How many grandchildren and great grandchildren Adam and Eve had in the first 130 years? No doubt, they had many grandchildren and great grandchildren by the time Abel was dead. This means that Cain had many nieces and nephews during those early years. In Gen 5: 4, we also read that Adam and Eve have other sons and daughters. Although it appears as though these other sons and daughters were born after Seth, that is not necessarily the case. Even if that was the case in that particular verse, we read in chapter 4 that there are already many people when Abel died. I will expand this one below. If we read Genesis 4:1, we will notice that it didn't say Cain was the first child of Adam and Eve. He was the first SON, but not necessarily, the first child. It is possible that Adam and Eve had a daughter or daughters, before Cain because Eve said " I have acquired man from the Lord". It looks as though she had daughters prior to Cain. While it is not certain that Cain had older sisters, we can conclude that Adam and Eve had daughters after Cain was born that are not mentioned in the Bible. As we are aware that the name of daughters are not usually mentioned in those days. When Cain left and live in the land land of Nod, Genesis 4: 17 says "Cain knew his wife" (KJV). It didn't say, Cain found a wife in the land of nod! The verse didn't say he found a wife from another race in another place. It was possible that Cain had been living single for quite sometime before he was married, or as some scholars even believe that Cain was already married when he killed Abel. Let us look at Genesis 4: 15-16. Following the death of Abel, Cain told God "..anyone who finds me will kill me." This is a proof that there are already many people on earth when Cain killed his brother. In the span of 130 years, we can assume that there are hundreds or thousands of people living on earth but not from another race, but from Adam's because Paul told the Corinthians that Adam was the first man, and he told the Romans, "sin entered into the world by one man, Adam." The phrase, "..anyone who finds me will kill me" also show that those people whom Cain were afraid of must be related to Abel whom he killed. Why would Cain be afraid to be killed by people from other race who know nothing about him, unless those people are related to Able? Why would other race care and how would they know he killed a brother? 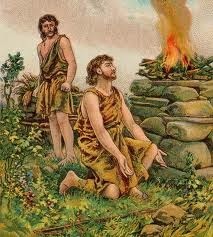 Thus, when Cain killed Abel, it was known to entire family and to the whole clan. Cain was afraid his relatives will take revenge for killing his own brother. Because Cain had other brothers and sisters as noted above, the answer to the question is Cain married one of his sisters or perhaps one of his nieces.